Like an undercover operative ready to reach out from the shadows and make their presence known like the hidden hand of night, the new Scorpion Covert Helmet is not to be trifled with. This Fall, Scorpion will be introducing their Covert helmet which you can transform from a half helmet to a three quarter helmet. Switching between the two is as easy as snapping and unsnapping a rear bottom sleeve. The helmet also comes with a front mask and drop down internal sun visor to completely shield your face from any bugs and road debris. While inside the Kwickwick liner will keep you head cool by channeling heat and humidity up to the ventilation ducts to be extracted out of the back of the helmet. The only color option is a solid Matte Black so you have no choice but to look like a member of Ra’s al Ghul’s F1 pit crew, the Speed of Shadows. 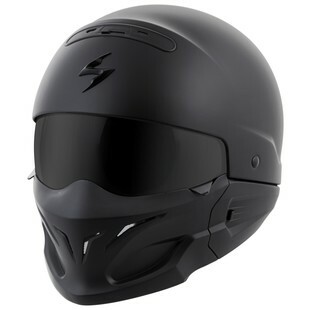 If unique helmets that are as rich in attitude as they are in menacing aesthetics are your thing, the Scorpion Covert is a lid that should be on your radar.